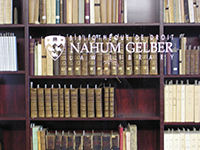 Nahum Gelber Law Library will be closed Saturday, Dec. 22 through Tuesday, Jan. 1. The Comic Blackstone / by Gilbert Abbott à Beckett. “Every gentleman ought to know a little of law, says Coke, and perhaps, say we, the less the better”.